Download "ARTICLE V. DISCRIMINATION AGAINST AN INDIVIDUAL WITH A DISABILITY"
1 ARTICLE V. DISCRIMINATION AGAINST AN INDIVIDUAL WITH A DISABILITY Sec Policy. (a) It is the policy of the city that no individual with a disability shall, on the basis of a disability, be excluded from participation in, be denied the benefits of, or otherwise be subjected to discrimination under any program or activity operated or contracted for by the city, provided that such participation does not fundamentally alter the program or activity. The city will make every effort to make a reasonable accommodation to individuals with a disability, consistent with the requirements of the applicable federal and state laws, and implementing regulations, including the Americans with Disabilities Act. (b) It is the policy of the city that all persons and entities receiving financial assistance from the city comply with all applicable civil rights laws and rules, including all of the rules and regulations found in this chapter. (c) The city endorses the fundamental purpose behind the Americans with Disabilities Act, which includes the removal of physical and non-physical barriers when readily achievable, where applicable. (d) The city further endorses a public policy that businesses within the city's jurisdiction must also comply with the Americans with Disabilities Act, including the removal of physical barriers whenever removal is readily achievable. Sec Definitions. As used in this article, the following words and phrases have the following meanings: Auxiliary aid includes services or devices such as qualified interpreters, assistive listening headsets, television captioning and decoders, telecommunications devices for deaf persons (TDD's), videotext displays, readers, texts on tape, materials in Braille, and large print materials. This list is not exclusive and functional equivalents may be substituted for any auxiliary aid. Financial assistance means the receipt, from the city, of any specific grant, loan, lease, contract (other than contracts for goods, insurance or guaranty, or services upon payment of full and fair compensation or upon obtaining a lease, license, or use privilege agreement upon payment of fair market value or the payment of fees required by city ordinance), or the use of city personnel or property without the payment of fair market value or full and fair compensation. Qualified person with a disability means an individual with a disability who, with or without reasonable modifications to rules, policies, or practices, the removal of architectural, communication, or transportation barriers, or the provision of auxiliary aids and services, meets the essential eligibility requirements for the receipt of services or the participation in programs or activities provided by a public entity. Readily achievable means easily accomplishable and able to be carried out without much difficulty or expense. Determining if barrier removal is readily achievable is, by necessity, a case-by-case judgment. Factors to consider include: a. The nature and cost of the action. b. The overall financial resources of the site or sites involved; the number of persons employed at the site; the effect on expenses and resources; legitimate safety requirements necessary for safe operation, including crime prevention measures; or any other impact of the action on the operation of the site. c. The geographic separateness and the administrative or fiscal relationship of the site or sites in question to any parent corporation or entity. d. If applicable, the overall financial resources of any parent corporation or entity; the overall size of the parent corporation or entity with respect to the number of its employees; the number, type, and location of its facilities. e. If applicable, the type of operation or operations of any parent corporation or entity, including the composition, structure, and functions of the workforce of the parent corporation or entity. Reasonable accommodation means any change or adjustment to the service, activity or program for the known physical or cognitive limitations of an otherwise qualified person with a disability unless it can be demonstrated that the accommodation would impose an undue hardship on the operation of the program. Any particular change or adjustment would not be required if, under circumstances involved, it would result in an undue hardship. 3 entity can demonstrate that making the modifications would fundamentally alter the nature of the service, program, or activity. (8) A public entity shall not impose or apply eligibility criteria that screen out or tend to screen out an individual with a disability or any class of individuals with disabilities from fully and equally enjoying any service, program, or activity, unless such criteria can be shown to be necessary for the provision of the service, program, or activity being offered. 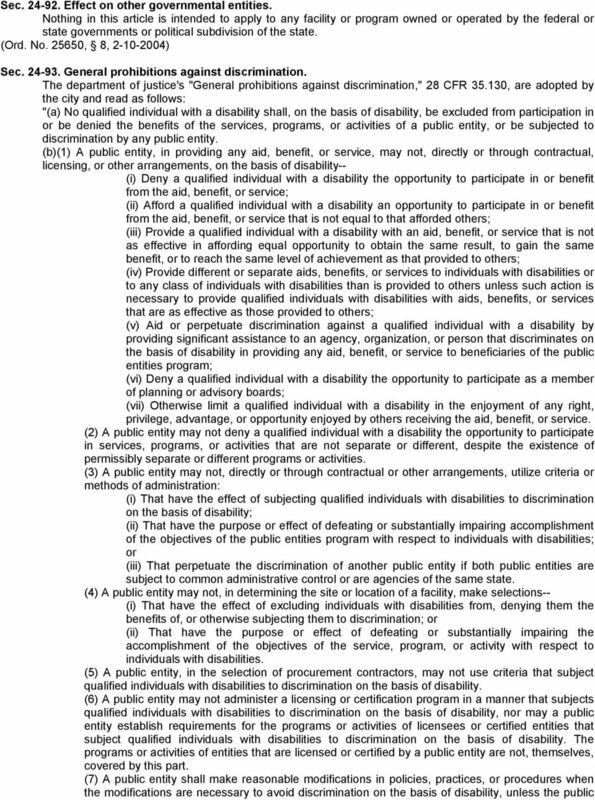 (c) Nothing in this part prohibits a public entity from providing benefits, services, or advantages to individuals with disabilities, or to a particular class of individuals with disabilities beyond those required by this part. (d) A public entity shall administer services, programs, and activities in the most integrated setting appropriate to the needs of qualified individuals with disabilities. (e)(1) Nothing in this part shall be construed to require an individual with a disability to accept an accommodation, aid, service, opportunity, or benefit provided under the ADA or this part which such individual chooses not to accept. (2) Nothing in the Act or this part authorizes the representative or guardian of an individual with a disability to decline food, water, medical treatment, or medical services for that individual. (f) A public entity may not place a surcharge on a particular individual with a disability or any group of individuals with disabilities to cover the costs of measures, such as the provision of auxiliary aids or program accessibility, that are required to provide that individual or group with the nondiscriminatory treatment required by the Act or this part. (g) A public entity shall not exclude or otherwise deny equal services, programs, or activities to an individual or entity because of the known disability of an individual with whom the individual or entity is known to have a relationship or association." Sec Requirements to ensure city facilities, programs, and services are accessible to qualified persons with disabilities. 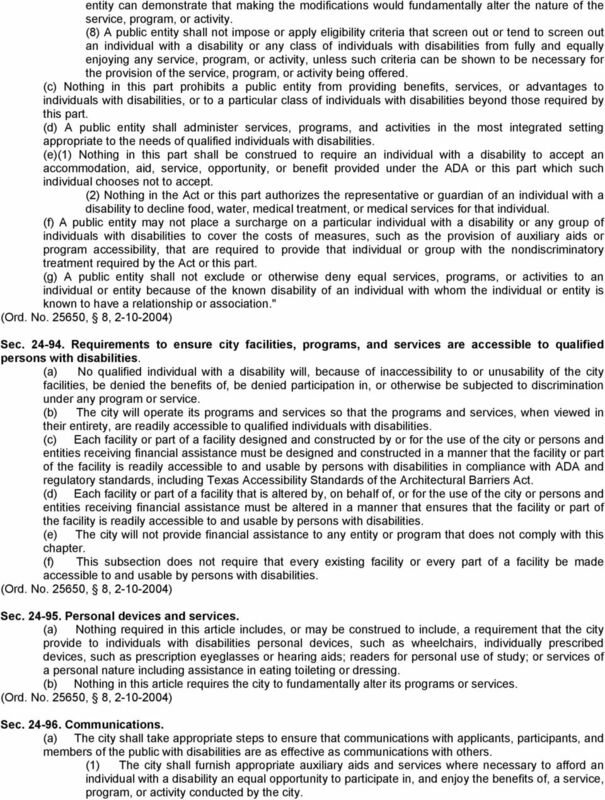 (a) No qualified individual with a disability will, because of inaccessibility to or unusability of the city facilities, be denied the benefits of, be denied participation in, or otherwise be subjected to discrimination under any program or service. (b) The city will operate its programs and services so that the programs and services, when viewed in their entirety, are readily accessible to qualified individuals with disabilities. (c) Each facility or part of a facility designed and constructed by or for the use of the city or persons and entities receiving financial assistance must be designed and constructed in a manner that the facility or part of the facility is readily accessible to and usable by persons with disabilities in compliance with ADA and regulatory standards, including Texas Accessibility Standards of the Architectural Barriers Act. (d) Each facility or part of a facility that is altered by, on behalf of, or for the use of the city or persons and entities receiving financial assistance must be altered in a manner that ensures that the facility or part of the facility is readily accessible to and usable by persons with disabilities. 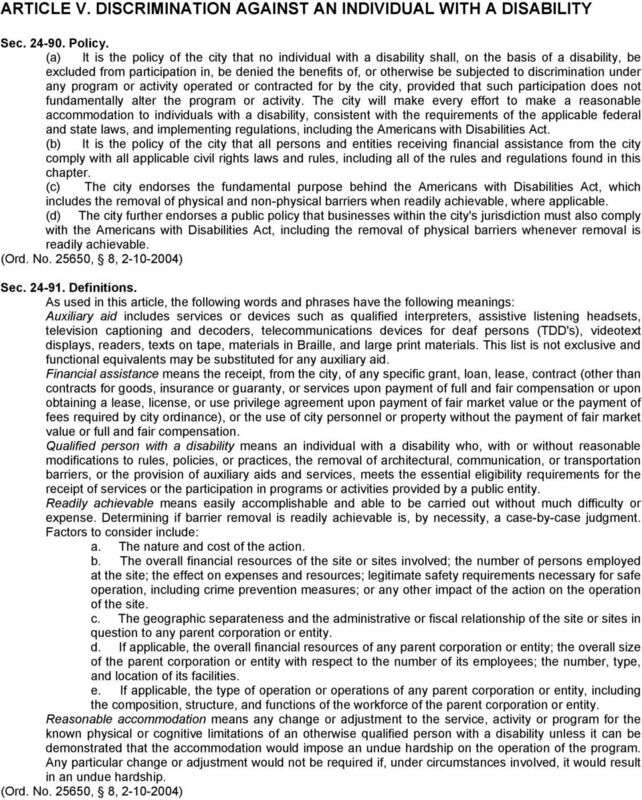 (e) The city will not provide financial assistance to any entity or program that does not comply with this chapter. (f) This subsection does not require that every existing facility or every part of a facility be made accessible to and usable by persons with disabilities. Sec Personal devices and services. (a) Nothing required in this article includes, or may be construed to include, a requirement that the city provide to individuals with disabilities personal devices, such as wheelchairs, individually prescribed devices, such as prescription eyeglasses or hearing aids; readers for personal use of study; or services of a personal nature including assistance in eating toileting or dressing. (b) Nothing in this article requires the city to fundamentally alter its programs or services. Sec Communications. (a) The city shall take appropriate steps to ensure that communications with applicants, participants, and members of the public with disabilities are as effective as communications with others. (1) The city shall furnish appropriate auxiliary aids and services where necessary to afford an individual with a disability an equal opportunity to participate in, and enjoy the benefits of, a service, program, or activity conducted by the city. 4 (2) In determining what type of auxiliary aid and service is necessary the city shall give primary consideration to the requests of the individuals with disabilities. (b) The city, and those receiving financial assistance from the city, must provide auxiliary aids and services as reasonable accommodations when they are necessary to ensure effective communication with individuals with hearing, vision, or speech impairments. Sec Certificate of compliance for applicants for financial assistance. All applications for financial assistance from the city must certify on a form provided by the director that the applicant will operate its programs and services in compliance with this article. Sec Annual evaluation by city. (a) The city will annually: (1) Evaluate, with the assistance of interested persons, including people with disabilities or organizations representing persons with disabilities, the city's current policies and practices. (2) Modify, after consultation with interested persons, including persons with disabilities or organizations representing persons with disabilities, any policies that do not meet the requirements of this article. (3) Take, after consultation with interested persons, including persons with disabilities or organizations representing persons with disabilities, appropriate steps to eliminate the effects of any discrimination that results from the failure to adhere to this article. (b) The city will maintain on file and make available for public inspection: (1) A list of the interested persons consulted. (2) A description of areas examined and any problems identified. (3) A description of any modifications made and of any remedial actions taken. Sec Adoption by the city of designated coordinator and grievance procedure. (a) The city will designate at least one (1) person to coordinate its efforts to comply with this article. (b) The city will adopt grievance procedures that incorporates appropriate due process standards and provides for the prompt and equitable resolution of complaints alleging any action prohibited by this article. Sec Nondiscrimination notice regarding individuals with disabilities. 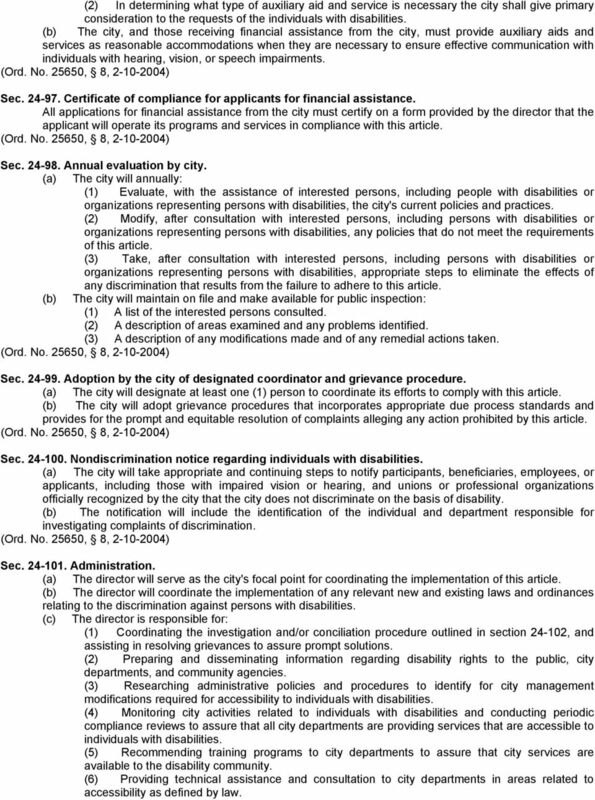 (a) The city will take appropriate and continuing steps to notify participants, beneficiaries, employees, or applicants, including those with impaired vision or hearing, and unions or professional organizations officially recognized by the city that the city does not discriminate on the basis of disability. (b) The notification will include the identification of the individual and department responsible for investigating complaints of discrimination. Sec Administration. (a) The director will serve as the city's focal point for coordinating the implementation of this article. (b) The director will coordinate the implementation of any relevant new and existing laws and ordinances relating to the discrimination against persons with disabilities. (c) The director is responsible for: (1) Coordinating the investigation and/or conciliation procedure outlined in section , and assisting in resolving grievances to assure prompt solutions. (2) Preparing and disseminating information regarding disability rights to the public, city departments, and community agencies. (3) Researching administrative policies and procedures to identify for city management modifications required for accessibility to individuals with disabilities. (4) Monitoring city activities related to individuals with disabilities and conducting periodic compliance reviews to assure that all city departments are providing services that are accessible to individuals with disabilities. (5) Recommending training programs to city departments to assure that city services are available to the disability community. (6) Providing technical assistance and consultation to city departments in areas related to accessibility as defined by law. 6 because that individual has made a charge, testified, assisted, or participated in any manner in an investigation, proceeding, or hearing under this article or any applicable law, including the Americans with Disabilities Act of (b) The city and any person or entity receiving financial assistance from the city may not coerce, intimidate, threaten, or interfere with any individual in the exercise or enjoyment of, or on account of the individual having exercised or enjoyed, or on account of the individual having aided or encouraged any other individual in the exercise or enjoyment of, any right granted or protected by this article or the Americans with Disabilities Act of Sec Remedial or voluntary action. (a) If the outcome of an investigation finds that the city has violated this article by discriminating against a qualified person with a disability, the city manager, or designee, will take any remedial or voluntary actions appropriate and necessary to rectify the problem. (b) All appeals of a grievance must follow the city's established grievance appeal procedures. 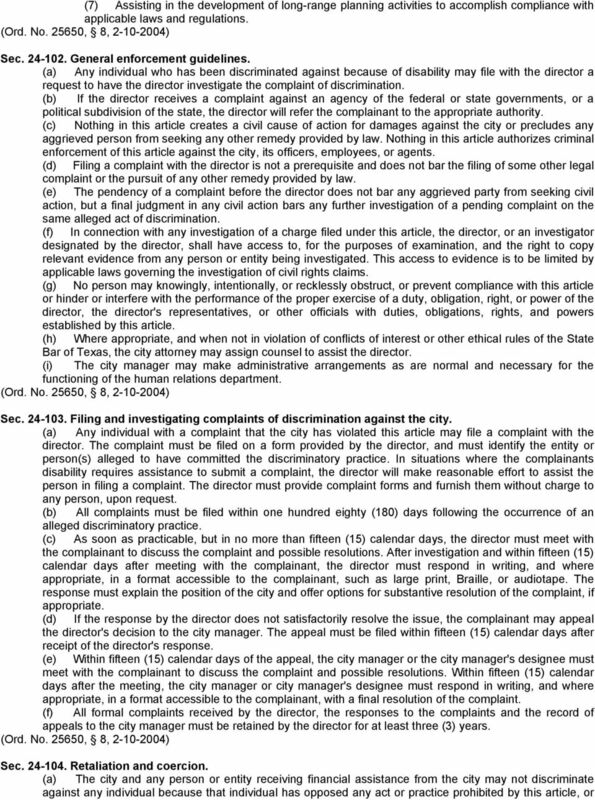 (c) If the outcome of an investigation finds that a person or entity hired by the city to operate a city program or a person or entity receiving financial assistance from the city has participated in the discrimination, the city manager, or designee, may require the person or entity receiving financial assistance from the city to take appropriate action to rectify the problem. Sec City council status reports. The director shall submit an annual status report to the city council that apprises the council on the implementation of this article. Resolution Agreement Cincinnati State Technical and Community College OCR Docket No. 15-13-2209 Cincinnati State Technical and Community College (the College) submits the following agreement to the U.S.
OUTREACH AND COMPLIANCE COORDINATION PROGRAM Administered by The Office of Small Business and Civil Rights Corenthis B. Kelley Director OUTREACH AND COMPLIANCE COORDINATION PROGRAM TABLE OF CONTENTS I. Office of Health Care Ombudsman, statutory duties Enabling statute, 8 V.S.A. 4089w (a) The department shall establish the office of the health care ombudsman by contract with any nonprofit organization. Americans with Disabilities Act: Title III - Public Accommodations Monica Murphy, Attorney Wisconsin Coalition for Advocacy 42 USC 12181 In 1990 Congress passed the Americans with Disabilities Act (ADA). SETTLEMENT AGREEMENT BETWEEN THE UNITED STATES OF AMERICA AND PEROUTKA AND PEROUTKA, P.A. EXHIBIT 13. PURPOSE To transmit Technical Assistance Guidance covering Complaint and Grievance Procedures. IN THE UNITED STATES DISTRICT COURT FOR THE EASTERN DISTRICT OF PENNSYLVANIA EQUAL EMPLOYMENT OPPORTUNITY ) COMMISSION, et al, ) ) Plaintiff, ) ) Case No. 04-4126 ) THE VANGUARD GROUP, INC. ) ) Defendant.